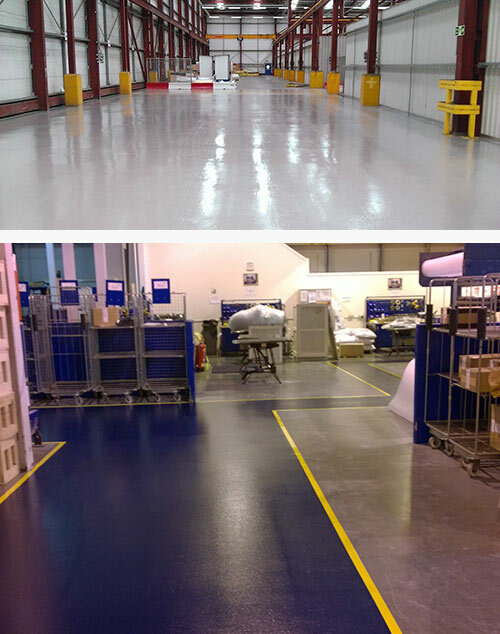 Warehouse Partners epoxy floor coatings are always specified to meet the individual requirements of our clients’ needs. These requirements invariably have several needs in common. These include the requirement of a hard wearing epoxy floor coating that can withstand contestant floor lift truck traffic and heavy goods’ movements, as well as a safe work surface for pedestrians, and also to comply with relevant health and safety regulations. Our commitment to a genuinely bespoke epoxy floor coating specification includes detailed site assessment and recommendation report without obligation. Consideration must be given when applying epoxy floor coatings to areas that may become wet or coated with any film that will present a slip hazard. This risk can be significantly reduced by using an anti-slip coating in these areas. Battery charging areas and other hazardous material storage areas will benefit from chemical resistance and easy cleaning following the application. Epoxy floor coatings comprise of dust free preparation of the concrete and are solvent free so are not harmful to our staff or other people during installation. Our combination of experience and superior quality epoxy floor coatings ensures that we will meet your needs every time. Please contact Warehouse Partners for a free site survey.